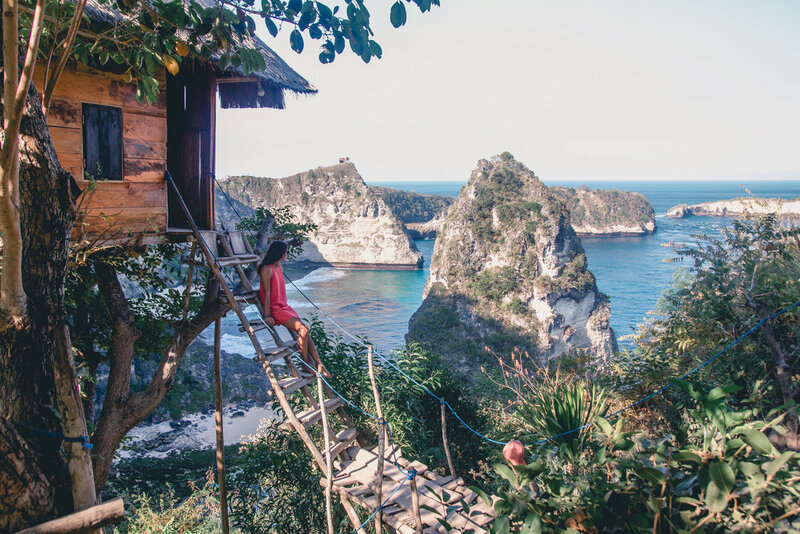 The famous Nusa Penida treehouse (also known as Rumah Pohon) and neighboring Thousand Island Viewpoint are two of Nusa Penida's most beautiful viewpoints. Rumah Pohon originally started as an eccentric Airbnb listing. The treehouse is perched high in a tree at the edge of a cliff overlooking Nusa Penida's gorgeous blue waters and epic rock formations. While heading down the 124 steps to the treehouse, you'll actually pass Thousand Island Viewpoint along the way. Each of these viewpoints give you slightly different views of the same incredible coastline. If you don't mind sleeping mostly outside and walking up 124 stairs every time you want food, you can still book a stay at the treehouse! Waking up to these views everyday would undoubtedly be an unforgettable experience. Rumah Pohon is located on the east side of Nusa Penida about 1 hour 15 minutes from Crystal Bay and most of the west-side attractions. The roads going through the center of the island are horrible so if you're not comfortable driving a scooter on bumpy, gravely roads, hire a driver or take the longer route along the north coast of the island! Entrance: 10k per person (this fee includes both Rumah Pohon and Thousand Island Viewpoint). One night stay in the treehouse: 555k ($37 USD) at the time of writing. Check here for current pricing. The treehouse and viewpoint face east so watching sunrise here would be incredible. We were feeling relatively lazy on this day so we went close to sunset instead. While you can't actually see sunset from here, the light is still beautiful and very few other people visit at this time! Avoid coming here in the middle of the afternoon as we've heard that there are crazy lines to take photos from the treehouse.